At least 95 people have been killed and about 163 wounded after a powerful explosion rocked the city centre of the Afghan capital Kabul. A plume of smoke was seen rising from the site of the explosion, which happened near the old Interior Ministry building at around 12.15pm local time. The offices of the European Union and the High Peace Council are also nearby, along with a number of foreign embassies and the police headquarters. Saturday is a working day in Afghanistan and witnesses said the area was crowded at the time of the attack. Nasrat Rahimi, deputy spokesperson for the Interior Ministry, said the attacker was driving an ambulance and told police he was taking a patient to a nearby hospital to get through a security checkpoint. He detonated the explosives at a second check point, Mr Rahimi said. “It is a massacre,” said Dejan Panic, coordinator in Afghanistan for the Italian aid group Emergency, which runs a nearby trauma hospital. In a message on Twitter, the group said more than 50 wounded had been brought in to that hospital alone. Buildings hundreds of metres away were shaken by the force of the explosion, which left torn bodies strewn on the street nearby. People helped the walking wounded away from the scene as ambulances with sirens wailing inched their way through the traffic-clogged streets of the city centre. Foreign Secretary Boris Johnson condemned the attack on Twitter: "Appalled by explosion in #Kabul today. "Third serious attack in #Aghanistan in one week - the Afghan people deserve peace." Labour leader Jeremy Corbyn also tweeted his condolences to the victims. "Saddened by the harrowing scenes in Kabul today, which has suffered an horrific attack that reports say has killed 95 people and left many more injured. My thoughts are with the victims and their families, and those working to save lives." US President Donald Trump said in a White House statement: “I condemn the despicable car bombing attack in Kabul today that has left scores of innocent civilians dead and hundreds injured. US Secretary of State Rex Tillerson said in a statement: “The United States strongly condemns today's horrific attack in Kabul. In France, the Eiffel Tower will turn off its lights on Saturday night as a mark of respect for the victims. Afghan forces have struggled to combat the Taliban since the US and Nato formally ended their combat mission at the end of 2014. Last week, Taliban militants killed 22 people in a luxury Kabul hotel. In December, an attack on a Shiite cultural centre in Kabul killed at least 41 people in an attack claimed by the Isis. Afghan authorities have also had to contend with a growing Isis affiliate that has carried out a number of large-scale attacks in recent years. 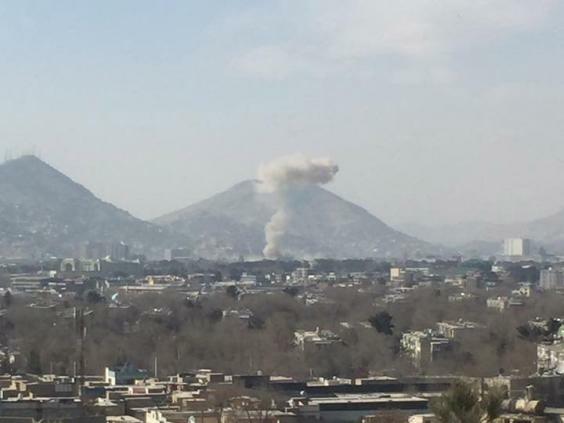 The latest attack will add pressure on President Ashraf Ghani and his US allies, who have expressed growing confidence that a new more aggressive military strategy has succeeded in driving Taliban insurgents back from major provincial centres. The United States has stepped up its assistance to Afghan security forces with the aim of breaking a stalemate and forcing the insurgents to the negotiating table. But the Taliban has dismissed suggestions that it has been weakened by the new strategy and the latest attacks have demonstrated that its capacity to mount deadly, high-profile attacks remains undiminished.